The emotional benefits kids receive from having pets are well known, including helping kids feel calmer and more confident, reducing stress and improving self-esteem. What might surprise some people is that this help goes beyond simple passive support. The animals actively seek avenues to assist in very specific ways, including helping kids with their homework. Pets have a desire to help and support their family members in any way they can. From listening to parents and kids, they learn that schoolwork is important, and when they see their kids struggling with it they seek out ways to help. Many pets assist their kids to focus, model good behavior, give hope and encouragement and lighten the mood when it becomes too stressful. Here some pets talk about how they do it. Ace knows his kids most need peace and quiet to study. “I see them concentrating and focusing so I leave”. He’s careful not to interfere, and doesn’t interrupt to ask to play. “I lay down and let them work”. He waits for the kids to be done and signal they’re ready to walk him. When his kids were younger he would sit next to them in a very obvious show of support. He would look at the books, then the kid, then back to the book to encourage the kid to keep trying. “Now I’m not needed” in that way. He misses that, and wishes he could do more for them now. “I wish they could see me smile” for support. “Hold their hand, tell them they did good.” He secretly wishes he could be by their side in school, supporting constantly and telling the kids ‘you can do it’. Rocky’s young kids are good students who are excited to be back at school, however homework time is always a struggle. He observed that the biggest challenge for the parents was getting the kids to stop goofing off and get down to work. So now “I help them prepare to study. I look them in the eye and say ‘Let’s settle down’”. He settles himself first as an example, and the kids follow his lead. Once his kids begin working he knows he can count on them to stick with it until they’re finished because “they want to learn more”. He helps by playing quietly by himself nearby as they study. Occasionally the kids look at him and he smiles back. “I wish I could look in more”, look at their books, read what they’ve written to check their progress instead of waiting for the teacher’s feedback. He also wishes he could carry their heavy backpacks for them. Coco sits next to her girl during homework time, leaning against her leg to remind her to sit still and stay at her desk. “I model behavior. I make her smooth”, even out her emotions, “so she doesn’t miss cues. She MUST learn, she MUST know”, because education is important. Coco knows her efforts are helping because “she moves less when I cuddle more”. Coco has noticed that the girl fidgets less when she’s sitting with her, and when the girl fidgets less, she concentrates more and for longer periods of time. Living with teenagers has taught Luna there’s no point in trying to study when her kids are wound up. “I help them with pent up energy” by first taking play breaks with them. “Then we walk and calm down”, quiet their minds together so the kids are ready to focus. She also listens while her girl practices her music lessons over and over, sitting facing her at attention like an audience. She noticed that without the performance aspect, her girl gives up too easily, and no one else in the house had time to listen. So Luna took it upon herself to be an audience of one. Luna would like to challenge her kids more, by asking them thought-provoking questions as a professor would. She sees they’re not really interested in the subject matter and feels an open-ended dialogue is important to engage them. Allie thinks her girl feels like “a prisoner” to her college work, it isn’t something she enjoys. When the girl should be studying her mind is on friends and classes and everything else going on but not on her studies. “I try to lick her cares away.” With physical touch, Allie tries to reduce her stress and bring her attention back to the moment. Sometimes it works. Athena knows her high school kid is great about beginning his homework but then he gets bored and restless and quits too soon. She’s also seen that being nagged to finish doesn’t work. But Athena is sneaky. She knows her boy will do anything to make her happy, and that as long as she’s in in his lap sleeping he won’t get up because he doesn’t want to disturb her. So when it’s study time “I curl up in his lap and make him read.” She pretends to nap until she knows he’s finished, actively helping him through the thought process. “I make his mind work faster. He takes too long to get an idea” because he’s not focused and she pushes him to think it through. She connects telepathically with his thoughts and helps direct him to see connections and reach conclusions. “I help his head get full faster.” She knows her help works because “He makes progress!” He finishes his homework sooner than without her help and he’s proud at his accomplishment. Patches (cat) understands her girl’s personality well, how she gets stuck and discouraged and then quits trying. Her girl feels “Schoolwork is HARD. You have to work, prepare. Study times are IMPOSSIBLE.” She always seems to run out of time to complete her work and upcoming tests are stressful. Pets want to help their families. They pay attention to people’s moods and behavior, what causes us to feel stressed or unhappy and through direct observation as well as trial and error they learn what helps us. 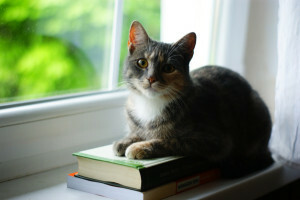 This school year, ask your pets to help your kids create better study habits. You can give your pets specific ideas – pick a something that seems consistent with the pet’s natural inclinations, or is a behavior the animal itself could use some practice with. Or just ask for help and see what creative solution your pet comes up with. Encourage your children to make it part of their study routine to ask their pets to help.